You might imagine that the most important day in my career would be linked to a significant achievement. Perhaps my PhD viva, or my first paper being accepted, or when I was offered a permanent academic job. It could be the day on which I had a Eureka! moment of discovery*. It’s none of these. Actually it took place when I was an undergraduate, only 20 years old, entirely alone and a long way from home. No data were collected. I spoke to no-one. And yet I can trace my whole academic trajectory from that day. The location was Kamchatka, a volcanic peninsula that protrudes from the far eastern edge of Russia. It’s 12 time zones from the UK, and even nine from Moscow. This is the wild east. I was there as part of a University of Cambridge expedition to visit the newly-created Bystrinsky Nature Park, which had been designated part of the Volcanoes of Kamchatka World Heritage Site. The region had only recently been opened to foreign visitors; a few years previously it was closed even to Russian tourists. There had been almost no work published in the international scientific literature since the great botanist Eric Hultén‘s Flora of Kamchatka, completed in 1930. It had nevertheless fascinated scientists, anthropologists and explorers since at least the pioneering expeditions of Krashenninikov (1711–1755). We were treading in noble footsteps. The main difference was that we were idiots. That doesn’t mean that we were stupid; more that we were young, naive and nowhere near as well-prepared as we thought we were. I’m still very relaxed about sending undergraduates off to far-flung parts of the world in much the same state because it was such a formative experience. We learnt more through throwing ourselves into it than any lecture could have taught us. So long as you’ve made reasonable plans and thought about safety, go for it. 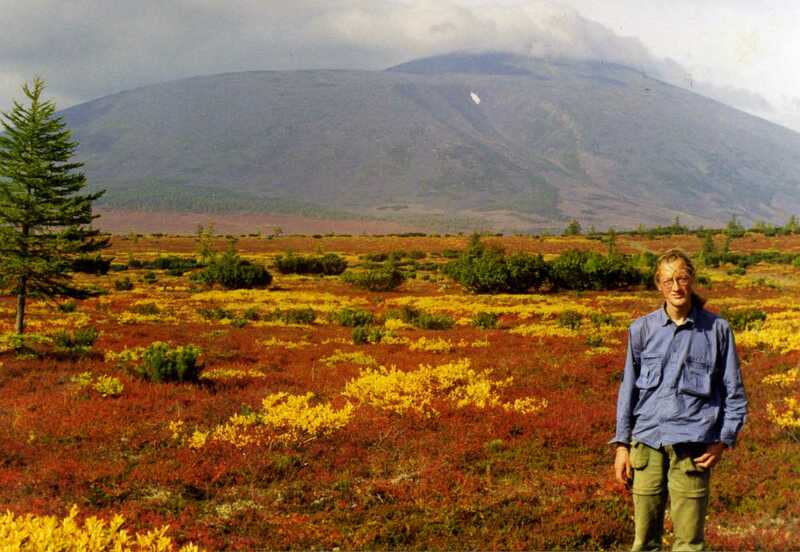 Younger and with much longer hair, at the foot of Anaun volcano, September 1998. Photo by Valeri Vassilevich Yakubov. As the flight landed in Petropavlovsk-Kamchatsky, the only notable town and regional capital, a full moon was bathing low clouds with an ethereal glow, punctured by the immaculate conical peaks of the volcanoes. I distinctly remember watching this mystical landscape beneath us and thinking — before I had even set foot in it — I must find a way to come here again. Our chosen project was to examine the spatial patterns of the local forests. I’d read that they were a mix of birch and larch, which I was assured by the legendary Peter Grubb was impossible, since both species are highly light-demanding and unable to recruit beneath a canopy. It turned out that they were exactly as Hultén had described (which is documented in a later paper). Sadly we never published our findings; they were used for our undergraduate final-year projects then shelved as we moved on to other things. I have since returned, however, and am still following up on those first hazy impressions. Enough of the background, what of the most important day? 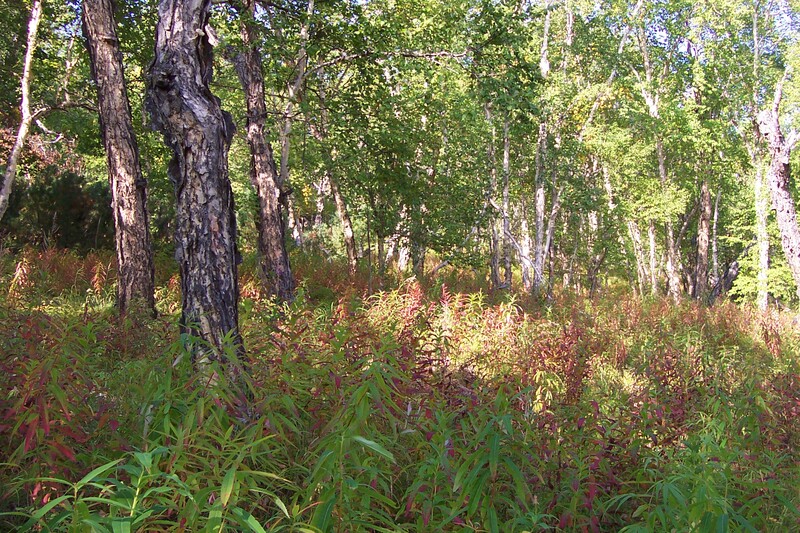 We had been surveying a forest of stone birch (Betula ermanii) a few kilometres east of the village of Esso. Stone birch is unlike any European birch — the wood is incredibly tough and the trees have a gnarled, low-branching form as a result of heavy snowfall in the long, cold winters, which gives them an interesting architecture. If anyone ever asks for my favourite tree, or favourite forest, then I can wax lyrical about them, but for now I’ll save that for another post. Stone birch (Betula ermanii) in the upper slopes of the Bystrya valley, south of Esso, Kamchatka. Our small team had finished work in the area and decided to head back to the village for a clean-up, change of clothes, hot meal and indoor bed. I wasn’t quite ready yet though, and opted to remain behind alone. Earlier in the trip we had attempted to climb the small mountain to the east but turned back in poor weather. I was determined not to be defeated and wanted a second shot. It was that night that I had my epiphany. Alone in the forest, sat by a roaring fire and surrounded by nothing but trees, I realised that this is what I wanted to do with the rest of my life. I sat and wrote a letter to a friend **, drank the remainder of the vodka and watched a curious mink dance through the branches above me in the flickering light ***. Nothing much happened. I sang a few songs to keep myself company (and the bears away), went to bed and passed an uneventful night. There is no doubt in my mind though — that was the crucial moment to which I can trace back my passion to work in, describe and understand the architecture of forests. It’s what I’ve devoted my life to ever since. The next day, almost incidentally, my strike at the summit was successful. I climbed back down, collected the tent, and walked back to the village to rejoin the team around nightfall. I revisited the same peak in 2008 on another expedition. Being especially eager to see it again, I reached the summit long before the students and other scientists. This was fortunate because I promptly burst into tears. That wasn’t the only time I cried with emotion on that expedition; the second time was a few month later, on what was the best day in my scientific life so far, almost exactly ten years after that solitary night in the woods. But that’s a story for another time. * I’m still waiting for one of those. Or at least one that doesn’t, a few days down the line, turn out to have been completely misguided. ** An interesting side-story in itself. She was at the time on another expedition in New Caledonia. Not only did she eventually receive my letter, she replied, and I received it — perhaps the only time that letters have been exchanged between Kamchatka and New Caledonia. This was of course long before the days of global internet and constant e-mail access. She is now a well-known conservation biologist in her own right and has probably forgotten our correspondence. *** Mink were introduced to the peninsula centuries ago by fur-trappers and were once one of its most important exports. They are now fully naturalised, and with so little hunting taking place, they have almost no fear of humans. This entry was posted in Uncategorized and tagged careers, expeditions, fieldwork, forests, personal on October 1, 2015 by Markus Eichhorn.